"The body, by force of the soul, can in fact be converted into a luminous fluid.... When, in its divine power, it completely possesses the body, it converts that into a luminous moving cloud and thus can manifest itself in the whole of its divinity." You might suspect that I am quoting Don Juan, from one of the Carlos Casteneda books. There was that famous scene at the waterfalls, for example, where Don Juan leaped up the rocks as if possessed of magical powers. But no, it is not Don Juan talking. It is Isadora Duncan, the dancer, in her book, The Art of the Dance. Heres another: "The process is akin to a deflating ball. The point of it is to shape my mood, really to expel my mood, all mood. Beginning the night before, I start to pace myself into an emotional neutrality....More than anything, I know I need to stay loose, so I force myself to deflate, consciously, concentrating on it....Im drained of feeling, utterly calm even though Im aware of the many things going on around me." Thats from the book, Faster, by Jackie Stewart, the race car driver. One more: "I wish I could show you a film of a dunk I had in Milwaukee....Its in slow motion, and it looks like Im taking off, like somebody put wings on me. I get chills when I see it....I think, when does "jump" become "flying"? I dont have the answer yet." Thats Michael (Air) Jordan, in Sports Illustrated. I want to give you more quotes. They are irresistable. 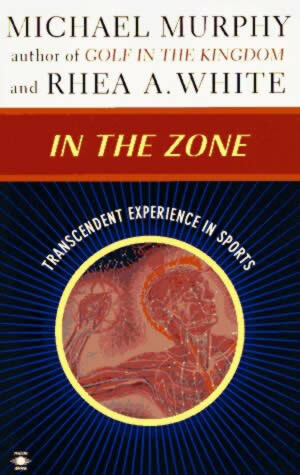 They are from the book, In the Zone: Transcendent experience in sports. (Penquin Arkana). It is an enormous collection of experiences that adds up to an incontrovertible body of evidence for the miraculous, mystical, psychic, and spiritual side of sports. If you have ever dreamed of flying where it was so real that the next morning you went outside to look up at the sky and you just knew that somehow the soul knows how to fly the body, then this book will convince you that your intuition is correct. Countless times have sports masters, and amateurs, too, experienced the impossible with their bodies. Their descriptions of mystical sensations of surrender, mystery, awe, immorality, or unity; of meditative states of peace, calm, stillness, or detachment; of magical moments of freedom, floating, flying, or weightlessness; of extraordinary ecstasy, power, or control read like testimonials from a spiritual sorcerers convention. It is not simply a matter of thrill seeking, for many of these athletes find their lives transformed, their vision of reality altered, and their desire enflamed to help others achieve similar glimpses of infinity, because they realize we are more than we think we are. Their experiences suggest we may be on an evolutionary path of further physical development as well as spiritual. The authors of this encyclopedic text would agree. Michael Murphy, founder of Esalen and the growth center concept, has, in his earlier book, The Future of the Body, demonstrated, with a voluminous amount of case studies, that the body as we know it is but a hint of things to come. Rhea White, past president of the American Society for Psychical Research, is slowly but surely revolutionizing parapsychology by leading the scientists out of the laboratory tombs and into the real life world of ordinary people and their extraordinary human experiences. Both of these authors are masters of compilation and artists of the archives, giving the "believe it or not" genre a new level of scientific respectability. With 1545 references, the bibliography is slightly more than one third the book. After we have feasted on this sumptous meal of amazing tales, do our authors add anything to help us digest all this information? Indeed, they offer some important perspectives and insights. First, we might consider the nature of sports. Is there a hidden dimension to these activities? The commercialization of sports has helped us to forget that the Greeks deified sports, and other ancient traditions also placed spiritual siginificance on the antics in the arena. We may think of sweaty dollar bills when someone mentions sports, but sports originate in religion. The authors provide some insights about why sports might be a perfect context for enlightenment and revelation. One of the hallmarks of the mystical orientation to meditation, for example, is to enjoy the practice for itself. Dont meditate for stress reduction, or to see God, but simply to meditate, to be aware. There is, in its finest manifestation, a similar orientation to sports. The athlete participates because of the enjoyment of the process. The mystical moments are a byproduct, not the goal of the activity.